This month I got to host our book club meeting and we decided to do a tea time theme. 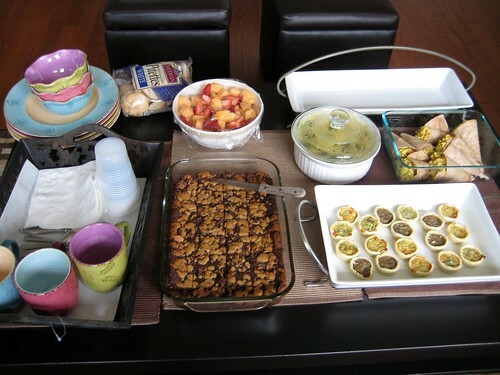 As usual we made too much food for just 3 people, but it was all yummy. We had spinach and artichoke dip served with mini pitas, curry chicken salad wraps, mini quiches, fruit salad, chocolate chip cookie bars, and of course, tea! 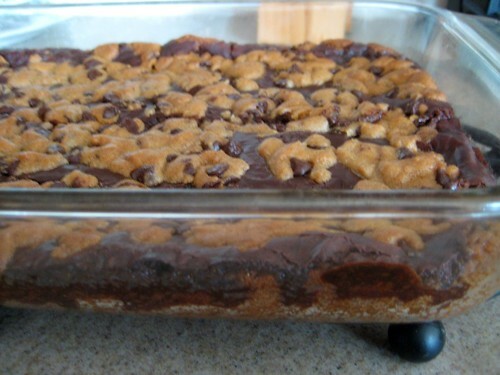 Recipe for the chocolate chip cookie bars follows below. I originally got these off the Weight Watchers message boards, which is ironic since these babies are quite fattening. On the boards they are known as chocolate chip crack and pervert bars. Take your pick as to which name you like! Smoosh 1 tube of the cookie dough into the bottom of a 9 x 13 pan, making sure to get as even a layer as possible. I break off in chunks to make it easier. In a large bowl, combine the chocolate chips and condensed milk. Microwave in 30 second intervals, stirring after each interval until chocolate chips are melted. It usually takes me 1 minute or less of cooking time. Pour chocolate chip and milk mixture over raw cookie dough, trying to smooth out over pan. Take remaining cookie dough and crumble over chocolate mixture. You can use the entire remaining tube of dough, I usually use half. Put pan in oven and bake for 30 minutes or until top cookie layer is golden. Cool, then slice. Note — these are really really really rich. I can usually only handle 1 piece max. As for the fruit salad, it’s just cantaloupe and strawberries. Easy peasy.